hello everyone. that's my new work. just made it today. the alcazar from this picture. Layer: about 50 layers or more. Wow, i am amazed and it looks wonderfully enchanting! Photograhpy plus concept colors. Kawaii *___* I Really like it ! I hate photoshop grass ya know, but this tim eit really fits and looks really nice.Love the sky ! The wallie is really nice ^^ I like the color of the atmophers( Don't know how to spell ^^). Good Job! Oh..and the sjy is really really really really pretty x3. ++--->favs. Absolutely beautiful *^__^* Not only idea, but final result is great! OMG. I'm breathless. This is sooo great! I mean.. wow, I'm so speechless. I couldn't expect that someone would make this. so beautiful and breathtaking. a fav from me! wow great wallpaper, i can see why it took eight hours, the picture is far more beautiful than the original(of course) so great job! great job on this ^_^ it has a wonderful aura and the quality is also great! Very different from your regular styles. Having 2 main objects in the wall sure creates a pleasent effect on the eyes. As your attention gets divided into different areas of the picture. Something like blending into the background wall, except less subtle. I think it's beautiful. You did a great job, I like the night sky with constellations. very beautiful and enchanting :) it really caught my eye! 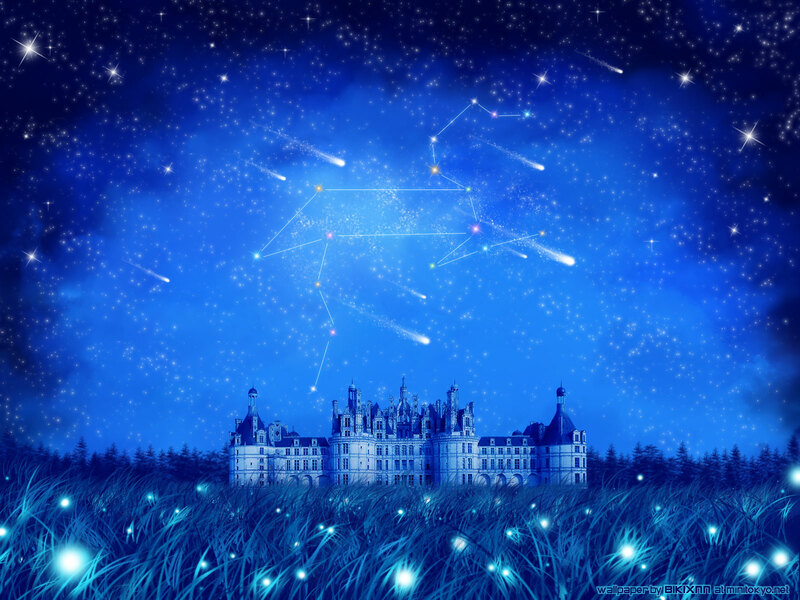 everything about it, the night sky, to the castle, and to the pretty grass with fireflies :) wonderful! good job and keep up the good work! OMG ! It look so stunning and beautiful ! I love the scenery around. The sky and around grasses. Great job on this. I love this so much ! Thank for sharing it with us ! beautiful portrait, very nicely drawn. Absolutely the dream castle of all fantasy. omg...nice work! no i mean...GREAT WORK!